A hydrodynamic field study of the Segara Anakan lagoon combined with a reconstruction of the recorded data using a three-dimensional numerical model provides insights into the processes driving the hydrodynamics of the lagoon. This includes bathymetry, quantification of water volume fluxes with ADCP measurements, sea level recordings, salinity measurements, water budget and numerical model results for the periods of the field studies. Salinity measurements at the Klaces village show a complete flushing of the western lagoon during neap tide in the rainy season, which is assumed to increase the sedimentation. Mean salinities of the western part are in the order of 10 and 21 g/kg, while the eastern part has a larger mean salinity of 27 and 32 g/kg for the rainy and dry season, respectively. 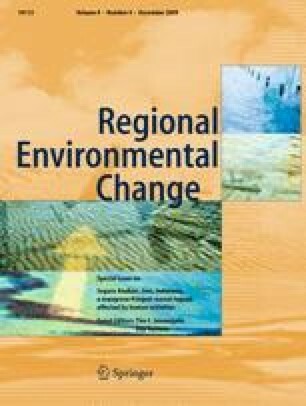 A numerical sensitivity study shows a relationship between the Citanduy discharge and the nett water volume transport between the eastern and western part of Segara Anakan. A nett transport to the west, which differs from neap to spring tides, turns to zero when Citanduy discharges are between 300 and 400 m3/s. The flushing time of the lagoon depends on the monsoon season and is about 1–3 days at the western outlet and increases to 12 days in the central parts. We would like to thank Teguh Wibowo and the numerous students of the Jenderal Soedirman University for their help in the field as well as Hendro Weksono, the captain of the ferry boat “Miund” who drove us safely through Segara Anakan. His knowledge helped us to record high quality data. Furthermore we thank the villagers in Klaces, Motean and Seleko for the maintenance and recording of the tide gauges. Thanks goes to Erwin Ardli, Bremen, Germany and Herbert Siegel for the satellite data as well to Volker Mohrholz and Toralf Heene for the ADCP processing tools and many hints regarding ADCP measurements and postprocessing. We thank Lars Umlauf for his age tracer ideas, Hannes Rennau for his help with the very first GETM setup and Torsten Seifert who made the ECMWF weather data available. All of them working in Warnemünde, Germany. The financial support by the German Federal Ministry of Education and Research (Grant No. 03F0391A) is gratefully acknowledged.